NAME: This organization shall be called The Guild of Harwich Artists, Inc.
PURPOSE: To encourage artists and those interested in art through education, fellowship and exhibitions, and to engage in charitable and educational works that benefit the residents of Harwich. Associate Member: Anyone interested in art. Student: Member enrolled in high school or college. Honorary Member: Any member who has served the Guild in a manner deemed appropriate for recognition by the Executive Board. An Honorary Member pays no dues, and enjoys all Guild benefits. All members must be residents or taxpayers of Barnstable County. However non-Harwich residents will comprise no more than 50% of the Harwich residents. A membership registration form must be completed and submitted with the annual membership dues. Artist members in good standing may exhibit in Guild venues in accordance with exhibition and gallery policies. Annual membership dues shall be established for each Membership Category. Any change in annual dues, as proposed by the Executive Board, shall be determined by a majority vote of members present at the meeting when the change is presented for a vote. Annual dues for the coming year are due and payable between November 1 and December 15. If dues remain unpaid by January 1, members may not exhibit at Guild venues in the dues year. Participation in exhibitions is subject to review and approval by the Executive Board. The Executive Board will review individual requests for participation in exhibitions for all applicants joining after December 15th. Section 1. The Officers shall be President, Vice President, Secretary, and Treasurer. Officers shall be elected at the Annual Meeting, and serve for a term of two years. The President shall preside at all meetings of the Guild and Executive Board. The Vice President shall preside in the absence of the President, shall assume the office of the President should a vacancy occur, and shall chair the Program Committee. The Secretary shall keep a record of all meetings of the Guild and the Executive Board, and shall be responsible for all correspondence of the Guild. The Treasurer shall be responsible for all financial transactions of the Guild. Monthly written financial statements shall be presented at membership meetings and meetings of the Executive Board. The Treasurer shall be responsible for all tax documents of the Guild and Gallery. The Treasurer’s records shall be subject to annual audit. The Gallery Representative shall be responsible for all transactions at the Guild Gallery. The Gallery Representative shall provide a monthly report to the Guild Treasurer. The Executive Board shall consist of the Guild officers, Gallery Representative, Chairpersons of Education, Membership, Publicity and Advertising, Banks, Alternative Venues, Art in the Park, and the immediate Past-President. The Board may appoint additional voting members-at-large, with the total board membership not to exceed 21 members. Duties of the Executive Board shall be to administer the affairs of the Guild, appoint chairpersons of committees, recommend policies to the membership, fill vacancies among the officers except President and Vice-President, and recommend annual dues amounts for the membership categories. The Executive Board shall meet monthly, prior to each regularly scheduled monthly Guild meeting. The Executive Board shall recommend gifts, donations and scholarships on behalf of the Guild to the membership for approval. 1. Scholarship: A scholarship shall be presented to a graduating high school senior who resides in Harwich for the current graduation year, attends Monomoy Regional High school or Cape Cod Regional Technical School, or is a home-schooled Harwich resident, or a Harwich resident attending a private school. The Applicant must be planning to pursue an education in the field of visual arts at an accredited college, and intend to pursue a career in the arts. An application must be filled out and all application requirements fulfilled. Upon completion of the recipient’s successful first semester at college, and presentation of first-semester passing grades, the scholarship check will be sent to the recipient. The scholarship funds shall come from the commissions on sales at Art in the Park and other sources. The Executive Board will make a yearly decision on the amount to be awarded. In the event of the dissolution of The Guild of Harwich Artists, the assets of said organization shall be distributed to one or more tax exempt organizations in the town of Harwich, who are engaged in some form of artistic pursuit. If this is not possible, then assets shall be distributed for one or more exempt purposes within the meaning of section 501(c) (3) of the Internal Revenue Code. No Guild member shall receive monetary compensation for work done on behalf of the Guild except the Treasurer. All efforts and hours expended by members are voluntary. The Guild shall meet monthly from September to June, at a date and time to be determined. Topics at meetings shall be limited to Guild business and art issues. The Annual Meeting shall be held in November and will include the Election of Officers in election years. New officers will assume their duties on January first. Any art gallery established by the Guild of Harwich Artists shall be managed by a by a Gallery Operating Committee. The gallery shall operate as directed in Gallery Guidelines, which are appended to the official copies of this document, and by the By-Laws of the Guild of Harwich Artists. Copies of proposed amendments and/or revisions to either the Constitution or the By-Laws shall be distributed by mail or email to the membership at least one month prior to the meeting at which such changes shall be voted. A two-thirds majority vote of members present and by proxy shall be required for adoption of said amendments, which shall become effective upon approval. Policy Objective: To establish a code of ethics which will enable the Guild of Harwich Artists to conduct operations, manage conflicts of interest, and enforce disclosure of same. This policy will enable the Guild of Harwich Artists to protect the integrity of the organization’s decision-making process and ensure member confidence in the integrity of that process while protecting the integrity and reputation of all members. Definitions: A conflict of interest is a situation in which an individual has separate and potentially competing interests or a duality of interests that could have negative consequences on the Guild. Actual Conflict: A conflict arising from a financial transaction, competition or exchanging of privileged/confidential information, between an individual member and the Guild’s interest, where the individual expects to gain. Individual Conflict: A conflict arising from individual interests, including those interests of the Guild’s business or other non-profit affiliations, family, employer, or other close associates who may receive benefit or gain. Perceived Conflict: A conflict that is not in nature a true conflict, but may appear to external constituents to be a conflict of interest. Members shall perform their official duties and arrange their private affairs in a manner that enhances public confidence and trust in the integrity of the Guild. Members have an obligation to act in a manner that will bear the closest public scrutiny, an obligation that is not fully discharged by simply acting within the law. Members shall not have a financial interest that could conflict in any manner with the discharge of their duties, such as employment in a municipal or federal funding agency. III. Members shall not knowingly take advantage of or benefit from information that is obtained in the course of their official duties and responsibilities that is not generally available to the public. Officers shall sign a declaration, attached to official copies of the Conflict of Interest Policy, that they will disclose any conflicts of interest and guarantee to keep the best interests of the Guild of Harwich Artists in mind as long as they are officers. During board meetings, a member is to declare a conflict of interest regarding an agenda item when discussion of that item comes up. The disclosure will be noted in the minutes, and the member recused during further discussion of that issue. The Guild President shall investigate the conflict in question, and if deemed necessary, the member may be asked to resign. VII. Declaration and Officers’ signatures (on Official Copies). Any Artist Member in good standing may participate in Guild events. Exhibitors must abide by Guild policies whether at indoor or outdoor events. All artwork displayed at Guild sponsored events is at the member’s risk. Exhibitors are encouraged to be in attendance at their individual display areas at outdoor events, and are responsible for the set up and take down of their artwork and displays. If an exhibitor must be absent during a sale, he/she must clearly assign another member as a representative. In the event of inclement weather, each exhibitor is responsible for protecting his/her own work. Exhibitors will display their artwork in a professional manner, matted, framed, and ready to hang, or matted and wrapped and displayed off the ground. Exhibitors agree to keep their display intact until the conclusion of the event. Extenuating circumstances will be addressed on an individual basis. Original artwork in any medium may be displayed. Entries are subject to Executive Board review regarding issues of size and liability. Artists shall exhibit and offer for sale only their own work. Reproductions shall not be exhibited, except at designated shows. Exhibition space is allocated on an equal-share basis. Display boxes or stands may be placed at the discretion of the Exhibition Committee. Size and number of artworks to be displayed shall be determined by space availability. Exhibitors shall have a Massachusetts Sales Tax Identification number. Massachusetts State Sales Tax shall be collected on all Guild sponsored sales and sent to the Massachusetts Department of Revenue. Sales commissions shall be collected and paid on artwork sold in any Guild-sponsored event. No commission shall be charged by the Guild on sales made in a venue where the vendor collects a commission on sales. Any sale concluded as the result of a Guild-sponsored event is considered to be a sale made at a Guild sponsored event, and a commission on such sales shall be payable to the Guild Treasurer. Commission amounts shall be recommended annually by the membership. Each exhibitor shall contribute to the cost of the venue, e.g. liability insurance, banners, and publicity. Proposed amendments to these policies must be distributed to the membership at least 30 days prior to the meeting at which the vote is to be conducted. The following information is provided for member awareness only, and is not part of the Exhibition Policies. It does not require action by the membership. Art in the Park is an outdoor Guild venue usually held in Harwich Port’s Doane Park every Monday, 10:00 a.m. to 5:00 p.m. from late June to Labor Day. Rain Date is the following Wednesday. Exhibitors shall have their own display equipment, be set up by 10:00 a.m. and remain so until 5:00 p.m. Exhibitors are responsible for their own display, including protecting it from the weather, and must remain in attendance during the day. In case of inclement weather after the exhibit opens, the event may be cancelled by mutual agreement. Space in the park is allocated by the event chairperson. The Guild may provide a Merchant Credit Card Account. Instructions for use of the credit card account will be provided annually by the Treasurer. At the conclusion of the last exhibition day of the season, each Art in the Park exhibitor shall pay a commission on total sales made during the season. A portion of the commissions shall be designated for charitable giving, the amount to be based upon a recommendation from the Executive Board and approved by the membership. By exhibiting at Art in the Park, the artist agrees to abide by the Exhibition Policies. The Guild may on occasion participate in alternative events. A chairperson will insure that the guidelines of the Guild’s Exhibition Policies are followed. All Guild members are welcome at these events. For any questions, contact the Guild President or email inquiry to info@guildofharwichartists.org. Members are invited to take advantage of the opportunity to continue personal work in the company of other Guild artists on Thursday afternoons from 1:00-4:00 p.m. at the Harwich Community Center at 100 Oak Street. Members bring their own supplies to Room 2, a room with a sink and ample space on tables and chairs. Sessions are held from early September through mid to late June. These sessions head outdoors, weather-permitting, painting scenes around the Cape in the company of other Guild artists. Members may decide at Monday’s Art in the Park where to paint that week, use email notices, or check the Guild website: www.guildofharwichartists.org to find out where Guild members are painting. Members and guests bring their own supplies and equipment, whether to paint, photograph, or just observe. The Guild of Harwich Artists offers members an artist profile on our website (guildofharwichartists.org) as part of your paid annual membership dues. After initial publication, changes to your artist profile maybe made once a year during the membership renewal period from November 1 to December 15 at no additional charge, or during the year for $25 via check made payable to The Guild of Harwich Artists. Use the guidelines below to email your artist profile information to the website committee at: info@guildofharwichartists.org. Feature Image: One feature image (.jpg) that best reflects your style; include: Title of Work, Medium, 0 x 0 inches size. Guild Activities: In what Guild activities do you participate? The Guild of Harwich Artists invite you to submit photos, events, and articles to be considered for publication on The Guild website (guildofharwichartists.org) and social media sites. We love to promote our member’s exhibits, their involvement in our community, highlight GHA events, and showcase our talented monthly guest artist demonstrators. Email submissions to info@guildofharwichartists.org. 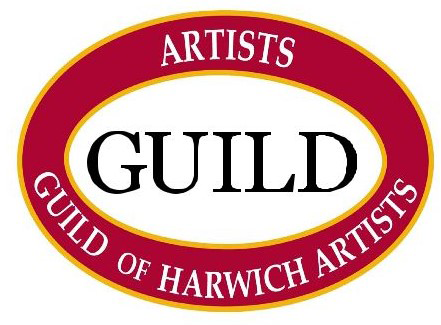 Submission of content does not guarantee publication, GHA Executive Board reserves the right to reject submissions that do not reflect the mission of The Guild of Harwich Artists. You grant permission to use the submission freely in whole or in part without compensation. You retain your ownership rights as applicable, and you will be given appropriate credit or acknowledgment. You grant The Guild of Harwich Artists the right to: a) publish on our website and in other digital or online formats including social media sites; and b) edit or abridge submission for accurate usage, spelling, punctuation, grammar, and/ or space/size requirements. You are the author and that the submission does not violate copyright or any other intellectual property rights or other rights of any third party.